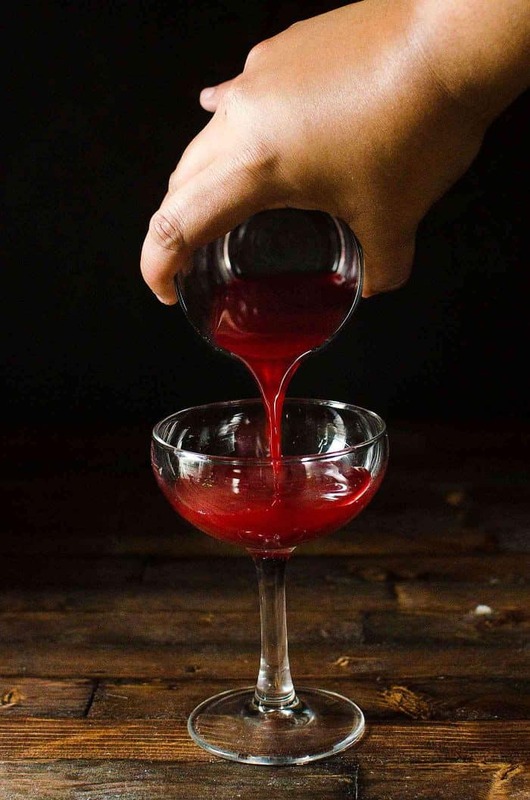 A simple, fruity, and refreshing Halloween cocktail – this Flaming Dragon’s Blood Cocktail (Thyme and Raspberry Daiquiri Cocktail) is a show-stopping drink to delight your party guests! So why would I assume a dragon’s blood is red? The truth is I didn’t. 🙂 I did quite a bit of research into what color dragon blood would be, ha! The possibilities are of course limited, either red (hemoglobin like yours and mine and other vertebrates’), blue (hemocyanin like in octopuses for example), or even green (like some worms, and rare lizard species with high levels of biliverdin). But by my basic reasoning I figured that dragons are land based animals so it only made sense for their blood to be like ours – red. BUT, a really bright red because fire-breathing dragons would have a much higher core body temperature increasing their hemoconcentration! Besides red looks more familiar and gory. Never heard of anyone passing out to the sight of blue blood. 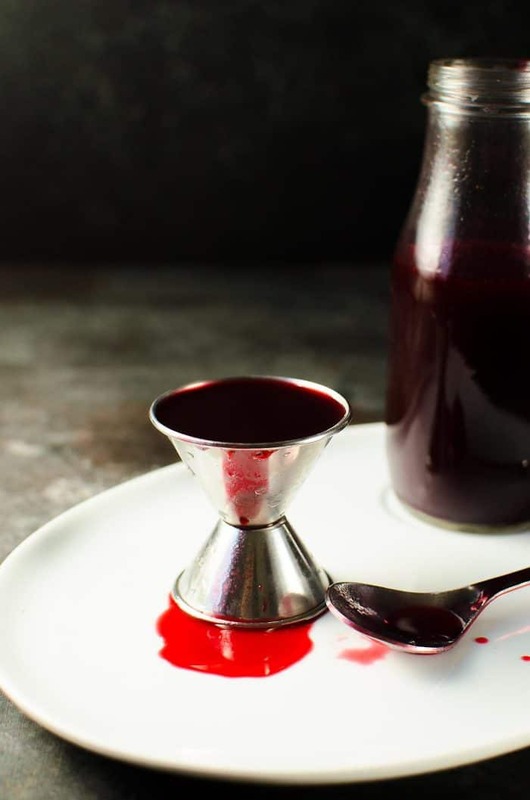 I wanted to create a gorgeous and striking rum cocktail that was red – like blood, but would also look classic and elegant for a Halloween cocktail party. Plus, I’m currently suffering from Game of Thrones withdrawal and mourning the loss of Viscerion. 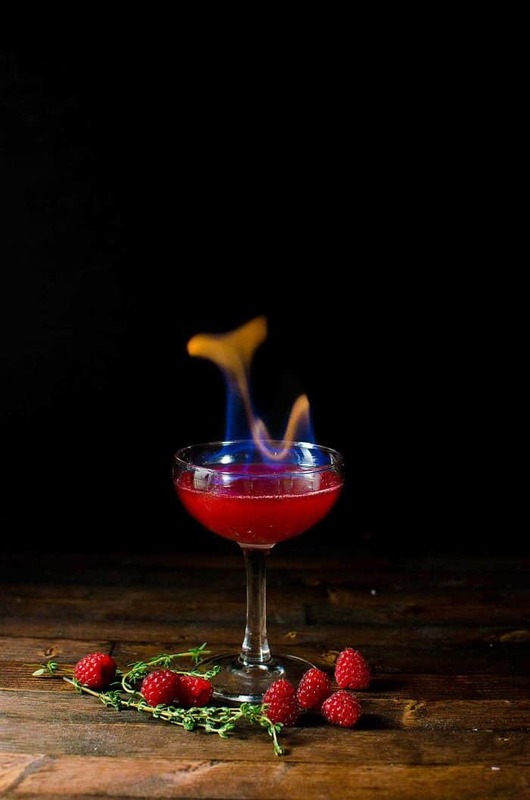 The result is this Flaming Dragon’s Blood Cocktail (Thyme and Raspberry Daiquiri Cocktail) made with Bacardi Superior Rum. 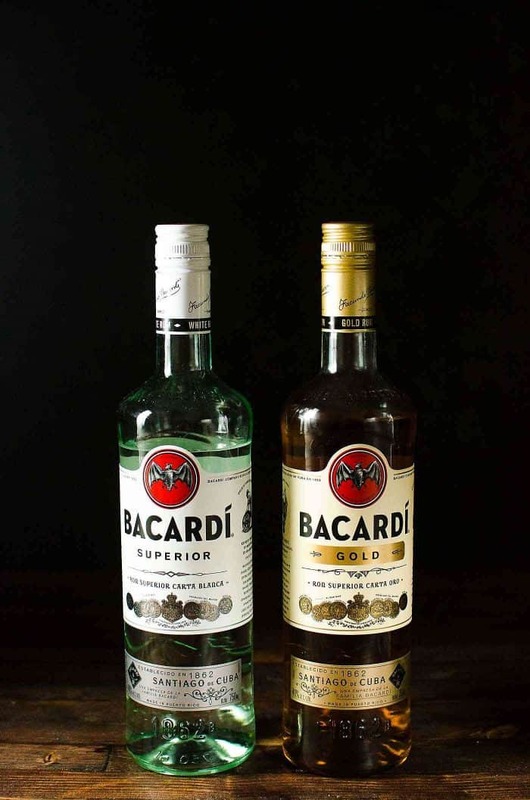 Bacardi offers both a White rum – Bacardi Superior, and a gold rum – Bacardi Gold, so you can choose whichever you prefer. 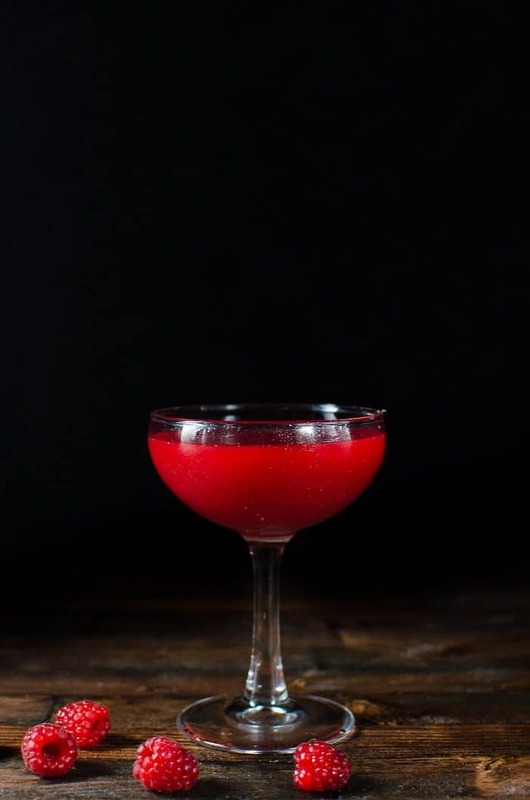 My first idea was to make a variation of a Hemingway daiquiri, but I just couldn’t find maraschino liqueur. So then I decided on a twist on a berry daiquiri instead. 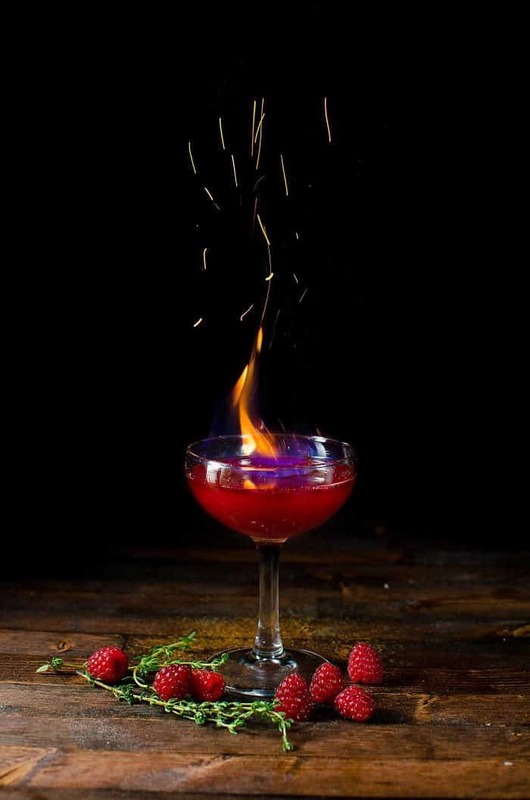 This flaming dragon’s blood cocktail (thyme and raspberry daiquiri) is made with Bacardi Superior Rum. 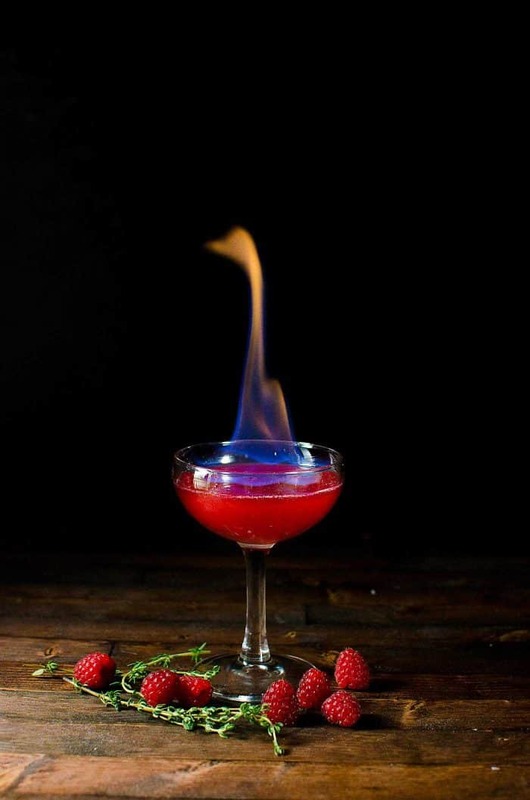 A flaming cocktail where there is a thin layer of Bacardi 151 on top that you can light up for a dramatic flaming cocktail. Or you can even do BOTH! I personally prefer option #1 (without the luster dust) because the absence of the shimmer makes it look more blood-like for us non-mythical beings, but then serve it as a flaming cocktail. 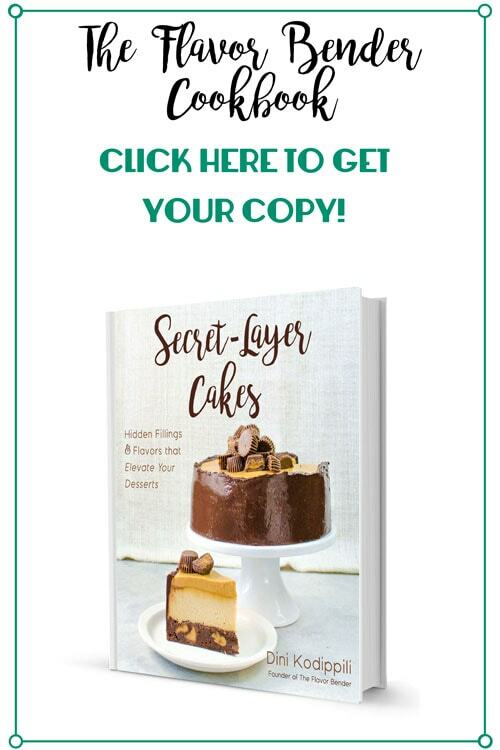 If you decide to add luster dust, you need to make sure that the thyme and raspberry syrup is completely strained, so that it’s clear with no pulp or seeds. I passed the syrup through a fine sieve and then through a nut milk bag. Without the luster dust you only need to strain it once through a fine sieve. 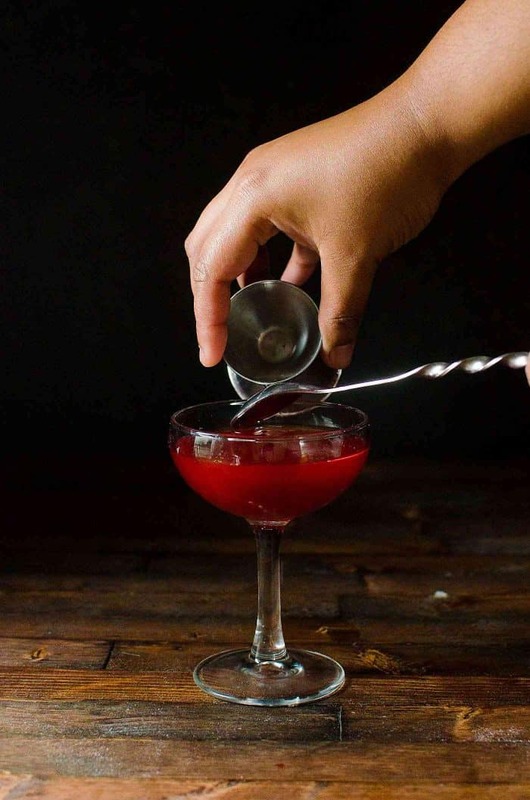 A clear cocktail (without pulp or seeds) is absolutely necessary IF you want to add luster dust to make it shimmery. 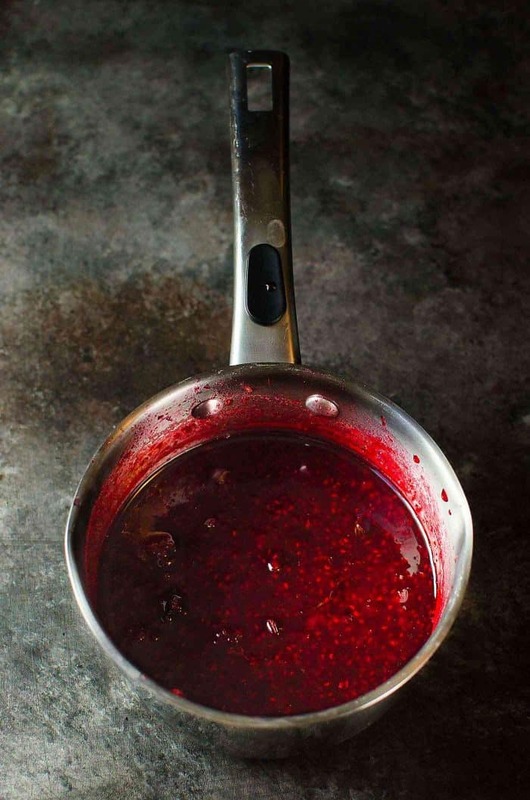 It’s a good idea to make a batch of the berry and thyme syrup ahead of time, so that it’s easy to simply pour the syrup into the drink to sweeten AND flavor the cocktail at once. Squeeze lemon juice into a glass or plastic container with a lid. By keeping some already squeezed lemon juice ready, it’s easy to measure the juice needed for your drinks as and when you need it. Don’t squeeze the lemon juice too far ahead of time though. You want it to be nice and fresh as well. Keep the syrup, lemon juice and the Bacardi rum in the fridge. This way you get nice, cool drink every time. Also keep ice at hand to make sure the cocktail is cold when you serve it. If you are going to set the cocktail on fire, make sure you DO NOT fill the cocktail glass to the rim. Even with the 151, the cocktail should not be filled to the rim. For an added magical touch, sprinkle a little cinnamon on top of the flames (from a safe distance of course), and watch the magical sparks! BUT, please do remember to blow out the flame. The flame is purely for theatrics and it goes without saying that the drink should not be consumed or carried around with the flame. 2 drops of brown food coloring 1 small drop brown gel food coloring - this is optional if you want to darken the color of the syrup more. Place all the ingredients in a saucepan (except the brown food coloring). Cook the mix over medium - medium high heat. Pour the syrup into a bottle and store in the fridge. 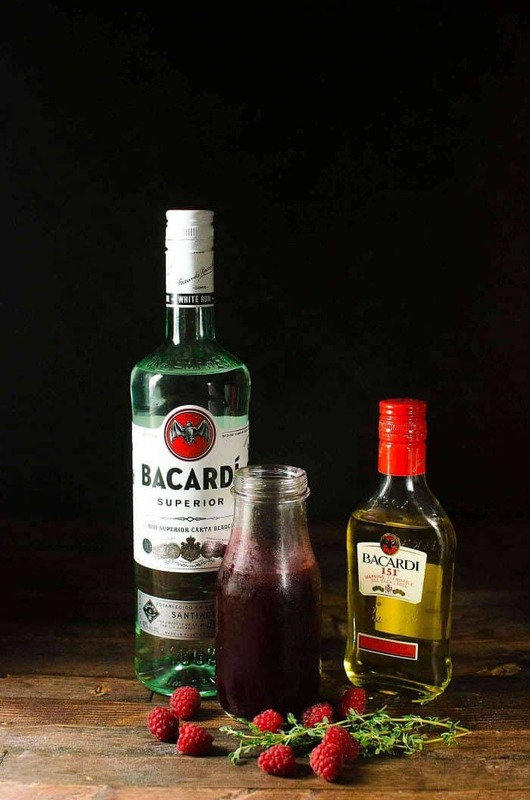 Make sure you get your rum bottles for your Halloween party this year to make this delicious and gorgeous cocktail for your guests. 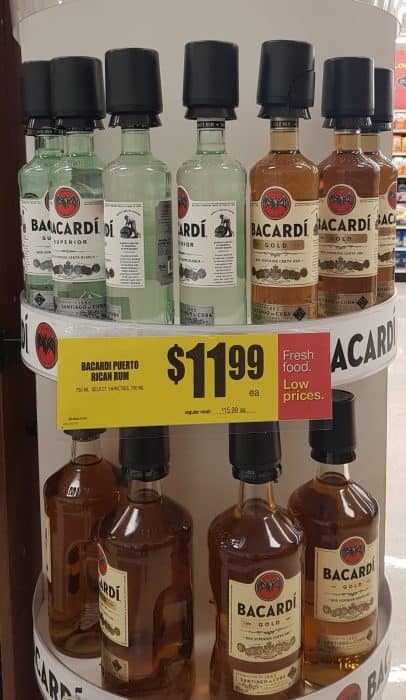 They’re so easy to spot because of Bacardi’s classic mark of the brand “bat” logo too. 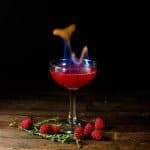 If you liked this Flaming Dragon’s Blood Cocktail (Thyme and Raspberry Daquiri) recipe, don’t forget to subscribe for new (and free) recipes and updates by entering your email address below (and get all these recipes delivered straight to your inbox), so you don’t miss out on a thing. 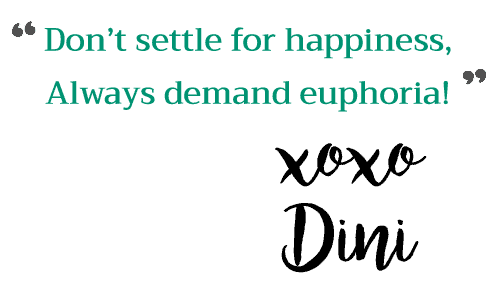 You can find me on FACEBOOK, TWITTER, INSTAGRAM, PINTEREST and GOOGLE-PLUS too. Hello! About how many cocktails does the raspberry syrup make?